How to add System.ComponentModel.Composition.dll in VS2010 IDE? With command line, I use /r: to add reference with VS2010 as follows. How can I add reference in VS2010 IDE? I tried to right click on the Solution Explorer, then clicked "Add Reference ...", but I can't find the System.ComponentModel.Composition. The Add Reference Dialog from the Productivity Power Tools is filtering for 3.5 framework assemblies because you're application is undoubtedly targeting 3.5. 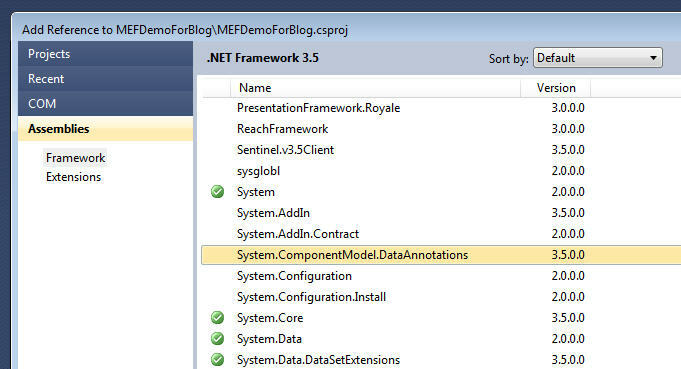 The System.ComponentModel.Composition.dll is a 4.0 Framework dll. You can add the reference by browsing to the 4.0 framework folder but this will stop your application from compiling. Not the answer you're looking for? Browse other questions tagged visual-studio visual-studio-2010 mef or ask your own question. Where is the Microsoft.VisualStudio.TestTools.UnitTesting namespace on VS2010?